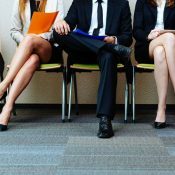 New York continues to lead for job gains this year, after recent performance in Houston was scaled back in revised employment counts for 2018. 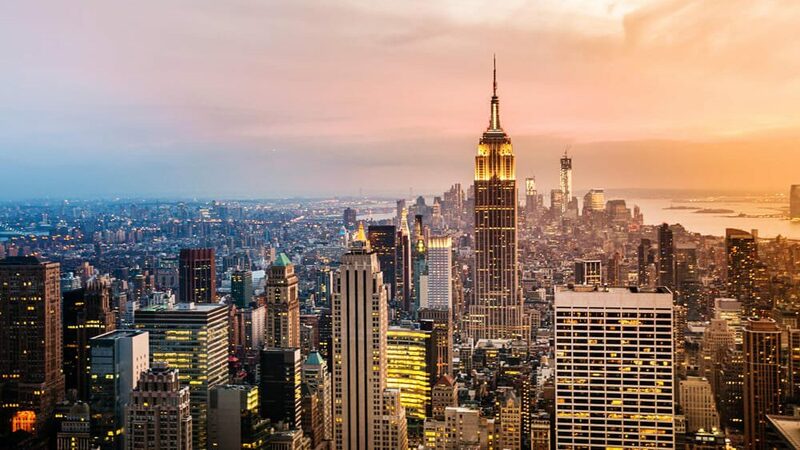 New York added 94,700 jobs in the year-ending February 2019, the highest annual total among U.S. metropolitan areas. Last month, New York was the only market to cross the 100,000-mark for annual job gains. 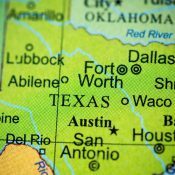 Those two performances bumped Houston out of the top spot after employment growth there was downgraded in the Bureau of Labor Statistics’ re-benchmarked and revised employment data for 2018, released in March. 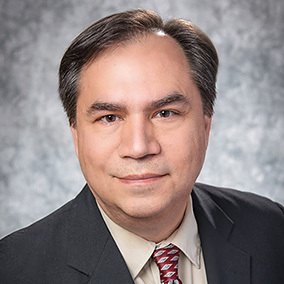 Where Houston had led the nation with annual gains exceeding 100,000 jobs each month in late 2018, it now appears the metro was averaging closer to 70,000 to 80,000 new jobs annually. 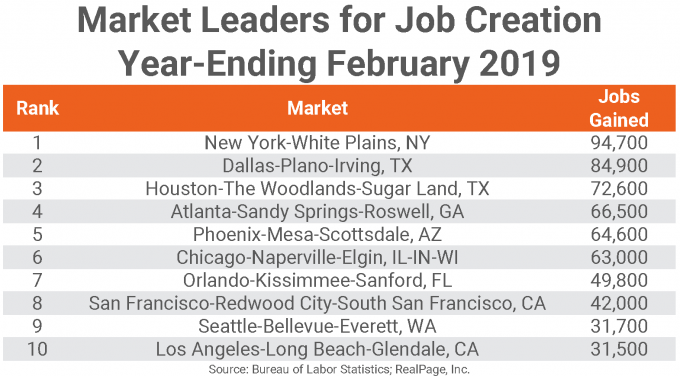 In February, Houston to fell #3 for annual job gains. New York and Dallas, the remaining top three job growth markets, also saw downward revisions, though not as severe as in Houston. In the 12 months ending February, Dallas gained 84,900 jobs and Houston gained 72,600 jobs. Atlanta placed #4 in February, moving past Phoenix and Chicago from January, while Orlando took the #7 spot as it did last month. San Francisco and Seattle returned to the #8 and #9 spots from January, and Los Angeles rounded out the top 10. In terms of overall gains, the total gains of the top 10 markets combined decreased from January, down 8.1%, or about 53,000 fewer jobs added. However, the 601,300 jobs added in the top 10 markets still comprised 24% of the total U.S. employment gain for the year. Dallas had the largest job gain improvement from the same 12-month period one year ago, adding 30,200 more jobs to its total gains than the revised total from the previous year. Chicago had the second-largest improvement in annual job gains with almost 27,000 more jobs added than last year. Strong employment improvement was also seen in Houston, San Francisco, New Orleans and Atlanta. 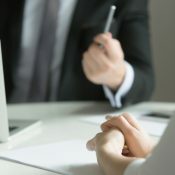 Los Angeles had the largest decrease in annual job gains compared to last year, and in fact, two other West Coast metros – Inland Empire and Orange County – joined the list of declining growth markets. East Coast metros Boston, New York and Washington, DC also experienced cutbacks in annual employment gains. 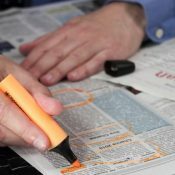 Ten of the metros that correspond to RealPage’s 150 largest apartment markets lost jobs in the year-ending February 2019. Minneapolis-St. Paul lost 10,400 jobs, followed by Youngstown, OH; Toledo, OH; Shreveport, LA; Ann Arbor, MI; Lansing, MI; Champaign, IL; Santa Rosa, CA; Fargo, ND; and Bridgeport, CT. 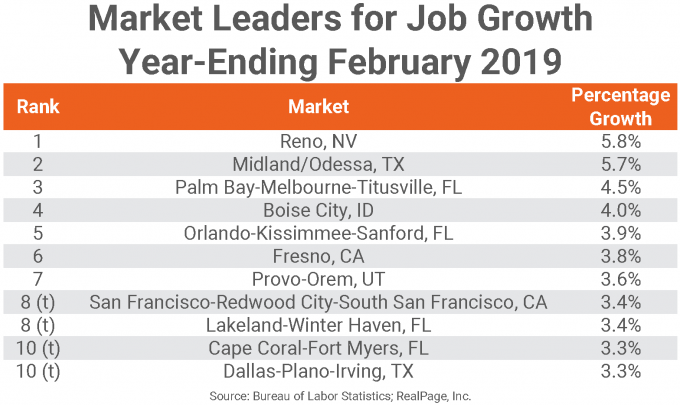 The largest metro areas in the top 10 list for job growth as a percentage of total employment for February 2019 include perennial contributor Orlando, but also San Francisco and Dallas. Other familiar metros in the top growth list are Midland/Odessa, TX, Reno, NV, Boise City, ID, Fresno, CA, Provo, UT and the Florida markets of Palm Bay, Lakeland and Cape Coral. Comparing current annual job growth rates with those from one year ago, six small metros — Trenton, NJ; Springfield, MA; Syracuse, NY; New Orleans, LA; Palm Bay, FL; and Wichita, KS — all had improvements of 160 to 190 basis points (bps). Metros with declining growth rates include: Midland/Odessa, TX (-770 bps); Stockton, CA (-320 bps); Riverside, CA (-310 bps); Vallejo, CA (-290 bps); and Jacksonville, FL (-250 bps).